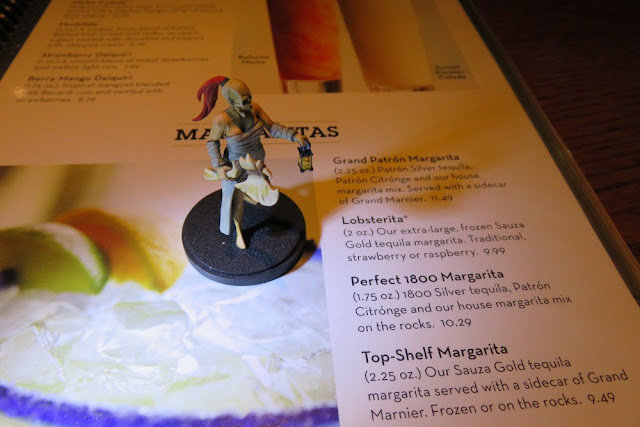 In Update #22, Kingdom Death:Monster designer Adam Poots said he would take a break from his kickstarter to take the team out to Red Lobster if TwitchGameNight lost the game of KD:M they were broadcasting. As part of the bet, if Twitch won, backers would get extra pinup rewards. TwitchGameNight won! Good news for us! But poor Poots and Co. missed out. So we took our KD:M team for a night out at the local Red Lobster. Gloomwych braved the snow to get there! Cassiopeia wasn't hunger and wanted a gift card. She's from out of town, hence the odd name. Amber needed her zanbato to crack the lobster. Here's Chestnut with her appetizer. Our waitress was great and really played along. I hope Poots and crew get to have a night out soon. Ludus Morituri Painted 5, Unpainted 3. Ludus Magnus Painted 5, Unpainted 5. Ludus Bestiae Painted 2, Unpainted 5. Servants/Engine Painted 5, Unpainted 2. Dickensians Painted 2, Unpainted 13. Guild of Harmony Painted 1, Unpainted 6. Scions of the Sands Painted 0, Unpainted 8. KOB Painted 18, Unpainted 22. COA Painted 16, Unpainted 23. Fortune Hunters: Painted 5, 394 pts. Dark Mariners: Painted 5, 452 pts. Scaly Horde: Painted 2, 171 pts. Axibalán Empire: Painted 5, 456 pts. Cerci Speed Circuit Painted 7, 64 pts. Star Nebular Corsairs Painted 7, 60 pts. Kingdom Death Monsters: Unpainted 7. Kingdom Death Monsters: Painted 4. Kingdom Death Survivors: Unpainted 15. Kingdom Death Survivors: Painted 9. Kingdom Death Pinups: Painted 2.